Is it Important to Feel Happy all the Time? Yes! When we are happy we naturally improve the mood of anyone with whom we interact. We are carefree, compassionate and fun to be around. Picture a happy friend and you will automatically start smiling. It is contagious. Smile away! Happiness also boosts your immune system and helps you recover faster from stress. A great mood impacts all areas your career and your love life. Happy women get better performance reviews, have more prestigious jobs and earn higher salaries. Let’s choose to be happy! On one hand, we can choose to take steps to be happier or we can just be jealous of those that are happy. 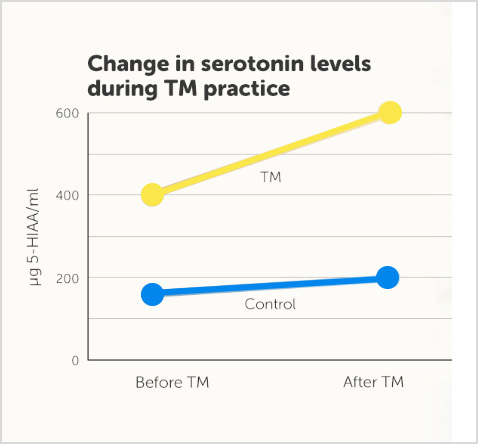 A study at a research institute in Vienna found that after 20 minutes of TM, there was a significant increase in the 5-HIAA serotonin metabolite. Even before they practised TM, the levels of the TM group were already twice as high as the control group, indicating a long-term permanent increase. Bujatti, M. and Riederer, P. Serotonin, noradrenaline, dopamine metabolites in Transcendental Meditation technique. Journal of Neural Transmission 39: 257–267,1976. To be happier, you need to focus on a skill that is closely linked to happiness. That’s where TM fits in. TM stimulates serotonin production without drugs.